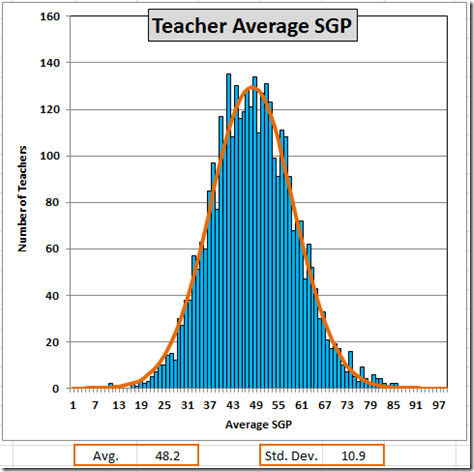 The most recent VDOE database of Student Growth Percentiles contains (anonymous) teacher IDs. This gives us a first peek at how well, and how badly, some of Richmond’s teachers are performing. 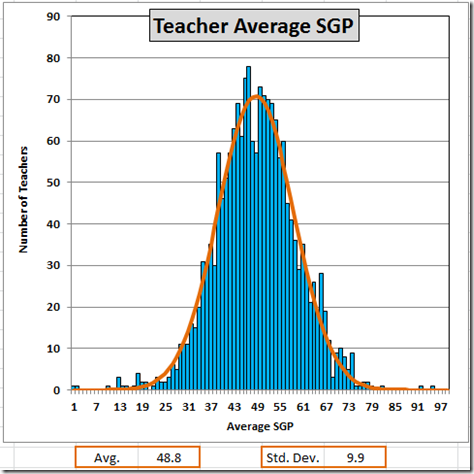 With all the earlier caveats, let’s start with the statewide distributions of teachers’ average SGP scores in reading and math. Brian Davison points out that both distributions are reasonably symmetrical, suggesting that we do not have an unusually large number of teachers doing particularly well or poorly. That said, no parent will want a child to be subjected to the reading teacher in the first percentile, the other teacher in the second, or the three in the eighth. 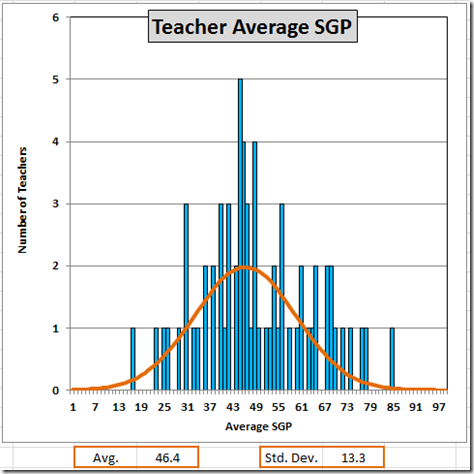 The math scores are more widely distributed, showing a larger number of excellent and a larger number of awful teachers. Aside from targeting the lowest performers in both subjects, these data suggest that we need math retraining more than reading. 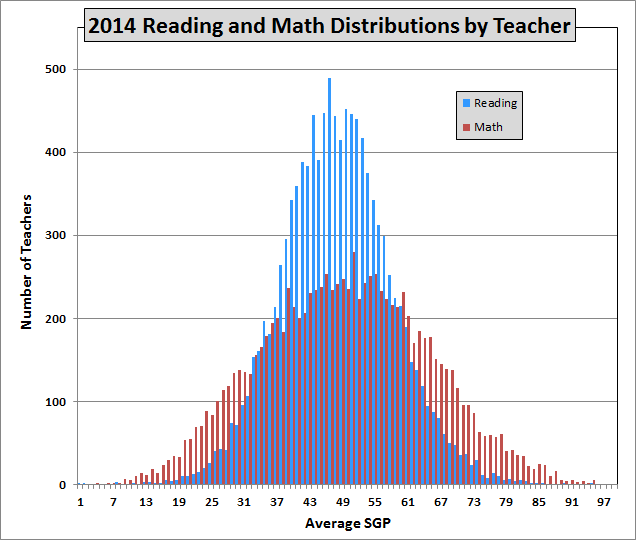 Turning to the data by grade, here is the distribution of fifth grade reading averages. 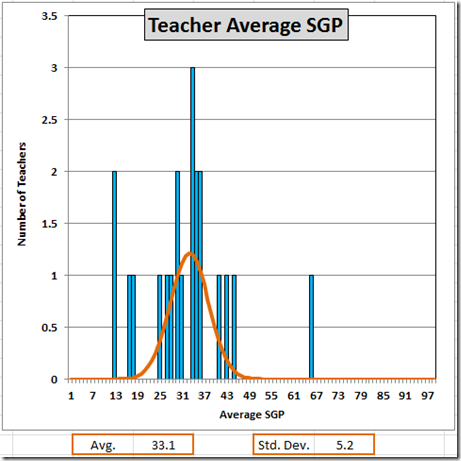 The orange curve is a normal distribution, showing the least squares fit. The average and standard deviation of the fitted curve are shown at the base of the graph. 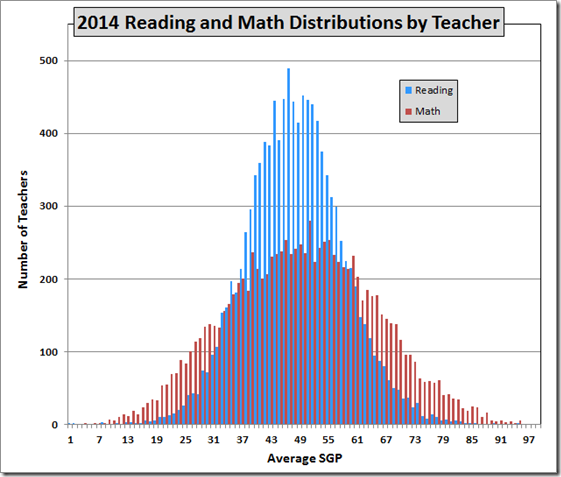 The distribution of sixth grade reading teachers is close to the same. 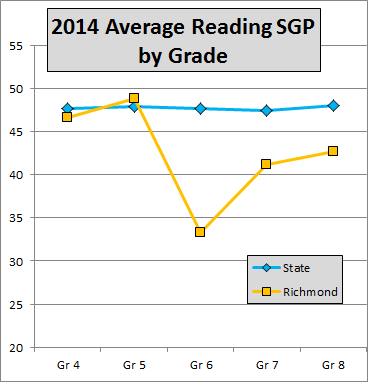 We already have seen that the Richmond average reading SGP plunges from fifth to sixth grades. As you see, this distribution is a bit wider than the statewide distribution. That is, Richmond has relatively more excellent fifth grade reading teachers than the statewide average, and also relatively more who are not performing. 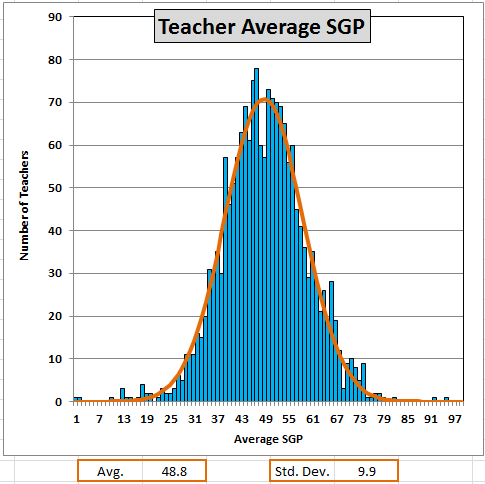 Five (of sixty-seven) Richmond teachers are more than two standard deviations above the state average; three are more than two standard deviations below. Those teachers at the low end need some work but, for the most part, Richmond’s fifth graders are in pretty good hands as to reading. 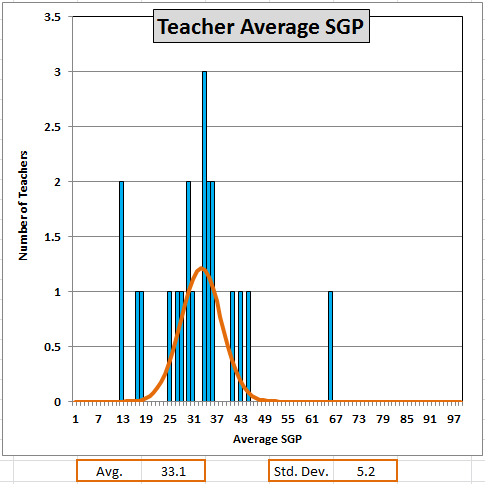 Only one of Richmond’s twenty-one sixth grade reading teachers produced an average student improvement better than the state average; none was more than two standard deviations above the statewide average. 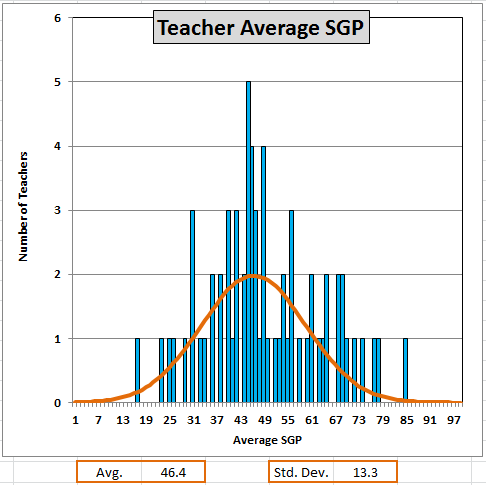 Six (or seven, depending on the rounding) were more than two standard deviations below the state average and four were more than three standard deviations below. The Richmond average is 1.5 standard deviations below the state average. 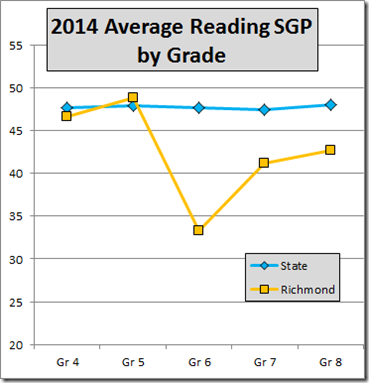 These data tell us that Richmond’s sixth grade reading teachers are not doing a bad job. They are doing an appalling job. The principals (and the Superintendent) now have a quantitative measure of teacher performance (at least as to reading and math). If they don’t do something (soon!) about rewarding the excellent performers and retraining or firing the poor ones, we’ll know they need to be replaced themselves. Is Marriage Good for Schools?